This world map keeps track of the places you've traveled. 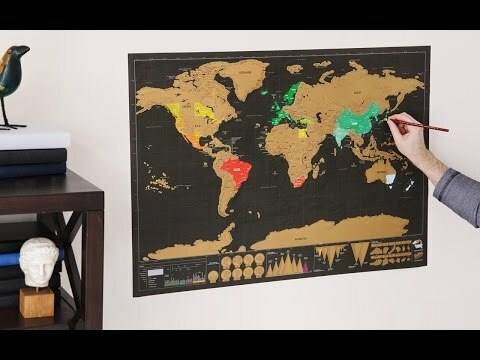 Using a coin, scratch off each area you visit to reveal the region underneath. Dimensions: Regular: 32.2" x 22.9"; Extra Large: 46.8" x 33"
Weight: Regular: 0.6 lb. ; Extra Large: 1.2 lbs. My granddaughter, who loves to travel, thinks this is so great! It's a super idea that is also interesting wall decor. My boss loved it, she travels the world so she was very happy to get this. Now if you could include a frame option... now that would be great. Perfect gift for the frequent traveler!